Nineties and noughties looks have been reappearing for several years now, and there is one person leading the charge of the comeback: Bella Hadid. Every day it seems like she is taking inspiration from the teen movies we all watched again and again and again at sleepovers. We could write an entire story about how she dresses like Cher Horowitz from Clueless, but she's also worn outfits that look like they're straight out of Never Been Kissed, Cruel Intentions and even Spice World. Scroll below to see how Bella Hadid is dressing like she's from a '00s rom-com. 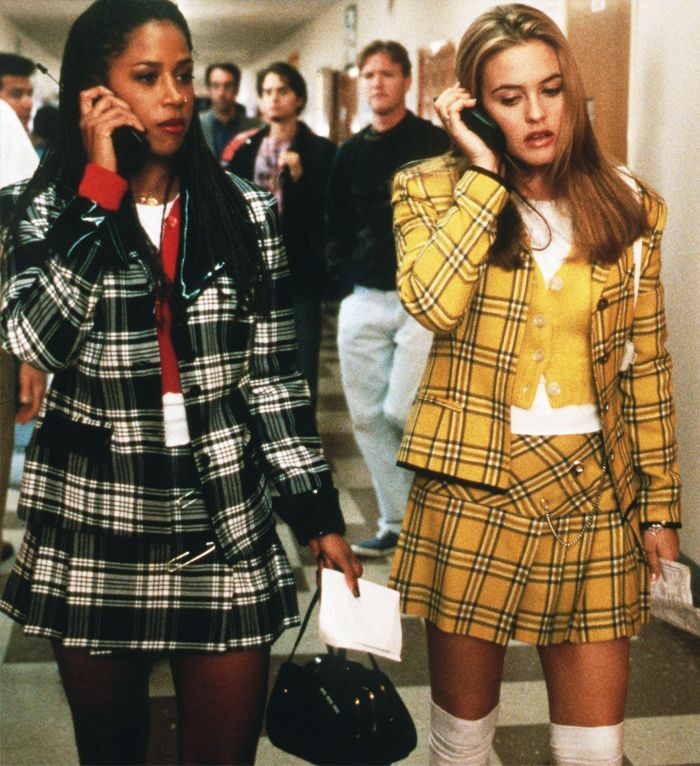 Judging by Bella Hadid's wardrobe, she is a fan of Beverly Hills icon Cher Horowitz from Clueless. Bella often wears Cher's signature plaid, in both yellow and khaki variations, either as separates or head-to-toe as below. On Bella Hadid: Topshop Lace Up Denim Mini Skirt (£34); Dior Flap Bag (£2400); Stuart Weitzman Clinger Boot (£535). On Bella Hadid: 3.1 Phillip Lim plaid top and Trousers (£472). Never Been Kissed's Josie Grossie might not be your usual style icon, however, Bella has been known to wear head-to-toe white (with white denim and a statement top in a typical Josie fashion) and also has a thing for fluffy touches, such as her black jacket below with a fur collar and cuffs. Both Gigi and Bella Hadid this summer have been looping brightly coloured jumpers around their shoulders in typical Ivy League fashion, giving us Cecile Caldwell in Cruel Intentions vibes. When Bella Hadid touched down in London wearing a camo jumpsuit and army boots, it looked like she was intentionally dressing like the sixth Spice Girl from Spice World. When in London, eh? At Wireless Festival this summer, Bella Hadid wore another rom-com classic outfit, an '00s cheongsam-inspired minidress (as Anne Hathaway wears in One Day above). Her hair is also the teen movie dream with the centre parting and hair clips pulling back each side. Next up, let us introduce you to the five hot, hot, hot brands that are set to rule this summer.